Dublin Airport Authority took the ‘green jersey’ approach with one of its fire engines before a decision was made to revert to the more traditional colours after issues with air traffic control visibility. DUBLIN AIRPORT AUTHORITY (DAA) spent €7,000 painting one of its fire engines a bright green colour before concerns about visibility led to it being repainted its original reddish-orange colour. 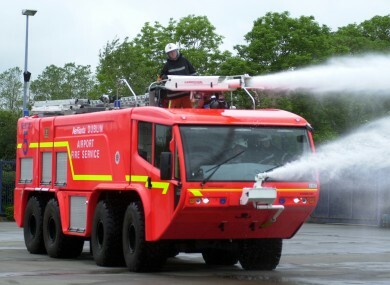 Airport authorities typically repaint fire tenders every ten years and about 18 months ago when one of the fleet was due to be repainted a new colour scheme incorporating DAA corporate colours was tested. This involved one of Dublin Airport Fire Service’s fire tenders (engines) being painted a bright green colour but after about six months concerns were raised about the new colour scheme’s visibility to air traffic control. Following consultation with the Irish Aviation Authority (IAA), it was jointly agreed to repaint the engine back to its original colour. The total cost of the new colour scheme and repainting job was €7,000. DAA said in a statement: “We repaint fire tenders at Dublin Airport about 10 years, as the colour typically fades. About 18 months ago, when one of the fleet was due to be repainted we tested a new colour scheme that featured DAA corporate colours. “After about six months, following consultation with the Irish Aviation Authority, the tender was re-painted in the original colour. The total cost of trialling a different colour was €7,000. The Irish Aviation Authority also confirmed the matter in a statement, saying: “The DAA trialled a new livery on a single fire engine at Dublin Airport. Email “DAA spends €7k painting fire engine green... then repaints it red”. Feedback on “DAA spends €7k painting fire engine green... then repaints it red”.